Lynzy Coughlin, the editor and brains behind Lynzy and Co, knows what it’s like to balance career and kids. So, we asked her—what’s in your (baby) bag? Keep reading to see her quick tips for keeping it all together—literally. As a mother of two, I’ve had to learn how to pack the perfect baby bag. When I had my first child, I quickly realized that lipstick and powders are quickly replaced with diapers, baby wipes and extra formula. But, sometimes you need to embrace the crazy. Now, my bag is fully loaded with the essentials that get me through the day—prepared and ready. Keep reading to see my list of what every mom should carry in their tote bag at all times. You can’t leave home without it! For obvious reasons. A bright color or pattern makes it easy to spot. Diapers for unexpecting changes, wipes (for obvious reasons) and extra shirts for me (just in case!). I always have these on me just in case.You never know what’s going to spill on their clothes, literally. I use this constantly. It not only protects me, but it protects my kids, too! Teething is one of those things that happens suddenly. It’s great to have a teething toy on-hand for emergencies. I can’t leave the house without my favorite Karen Walker shades that I’ve had for over 4 years! You always need to have snacks on board with the kids—there’s nothing worse than a hangry kid (or mom for that matter). I can’t live without my favorite Burt’s Bees lipstick. It’s ultra-moisturizing and has a subtle tint! If I ever need to keep the kiddos occupied, I’ll bring along a tiny coloring book and crayons for a keep-the-boredom away activity. 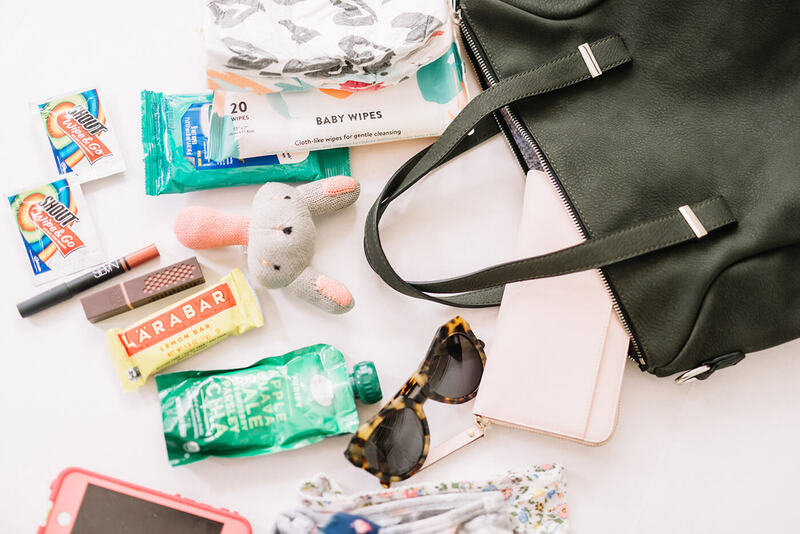 With a little one, there’s bound to be a bathroom emergency or diaper explosion—portable changing pads mean that I don’t have to run to a bathroom. Those are my 10 must-haves for a baby bag. What are yours? Tell Stitch Fix and I in the comments below! Lynzy Coughlin is the editor behind Lynzy and Co.